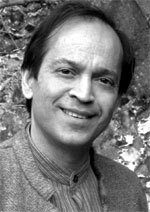 Born in Calcutta, India, Vikram Seth was educated at Corpus Christi College, Oxford, Stanford University and Nanjing University. He has travelled widely and lived in Britain, California, India and China. His first novel, The Golden Gate: A Novel in Verse (1986), describes the experiences of a group of friends living in California. His acclaimed epic of Indian life, A Suitable Boy (1993), won the W H Smith Literary Award and the Commonwealth Writers Prize (Overall Winner, Best Book). Set in India in the early 1950s, it is the story of a young girl, Lata, and her search for a husband. An Equal Music (1999) is the story of a violinist haunted by the memory of a former lover. Vikram Seth is also the author of a travel book, From Heaven Lake: Travels Through Sinkiang and Tibet (1983), an account of a journey through Tibet, China and Nepal that won the Thomas Cook Travel Book Award, and Arion and the Dolphin: A Libretto (1994), commissioned by English National Opera, with music by Alec Roth. His poetry includes Mappings (1980), The Humble Administrator’s Garden (1985), winner of the Commonwealth Poetry Prize (Asia), and All You Who Sleep Tonight: Poems (1990). His children’s book, Beastly Tales from Here and There (1992), consists of ten stories about animals told in verse. In a collection of poems, Three Chinese Poets (1992), Seth offered up an ambitious and daring translation of three poets of the T’ang Dynasty: Wang Wei, Li Bai and Du Fu. Vikam Seth’s latest major work is Two Lives (2005), a memoir of the marriage of his great uncle and aunt.